For better or worse, this decade has marked an explosion of mobile-related lawsuits and anti-trust actions across the globe. Now, that trend is reaching what may be its apex, with Qualcomm filing a countersuit against their increasingly distant customer, Apple. This latest suit comes in response to Apple taking action against Qualcomm earlier this year in multiple forms. At the regulatory level, Apple has been levying complaints against Qualcomm for some time, providing evidence and testimony that is being used in anti-trust suits against Qualcomm, particularly the most-recent suit by the US FTC in January of this year. The crux of the regulatory suits has been over Qualcomm’s patent and technology licensing business, and whether the company was refusing to follow FRAND policies while charging unreasonably high royalties. Meanwhile at the business level, in the same month Apple also sued Qualcomm directly over many of the same issues, along with accusing the company of withholding a billion dollars in rebates. Qualcomm’s countersuit, which was all but expected, forms the backbone of the company’s response to Apple’s own suit and involvement in regulatory actions. In a short press release, the company noted that they intend to “vigorously defend” their business model, while laying out a case for why they believe Apple is in the wrong and why Apple should owe them damages. A big part of Qualcomm’s countersuit, unsurprisingly, is focused around Apple’s hand in various regulatory suits, accusing the company of “misrepresenting facts and making false statements.” Qualcomm is also accusing Apple of generally mischaracterizing their business interactions with Qualcomm, and interfering with Qualcomm’s business relationships with the third-party firms that actually manufacture Apple’s iOS devices. All told, Qualcomm is accusing Apple of taking several steps to force them to agree to lower licensing rates, and that in doing so Apple violated FRAND principles. However the most interesting points from Qualcomm’s countersuit involves the iPhone 7, which is the first phone from Apple in several years to offer models without a Qualcomm modem. Here, Qualcomm is specifically accusing Apple of not utilizing the full performance of the Qualcomm modems in those models, while also threatening Qualcomm to prevent them from publicly touting the performance of the Qualcomm-powered models. Both of these points are almost certainly related to Apple’s configuration choices with the various iPhone 7 models. 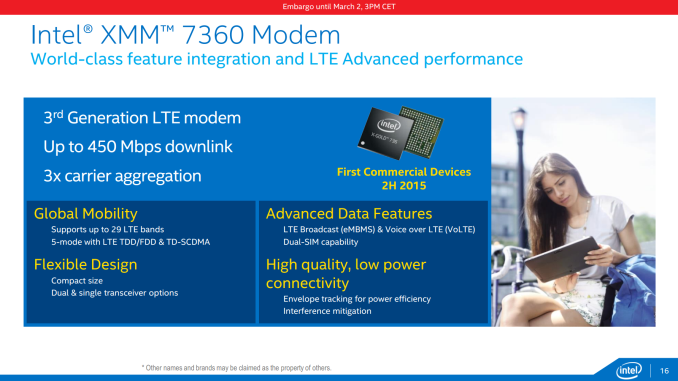 While the Snapdragon X12 used in the Qualcomm-powered iPhones is capable of LTE Category 12 features, the Intel XMM 7360 modem used in the other models is only capable of LTE Category 10. Presumably to ensure the phones’ abilities were consistent, Apple opted not to enable many Cat 12 features on the Qualcomm models, such as 4x4 MIMO and 256-QAM, essentially limiting it to the same 450Mbps down speed as the Intel models. In any case, at this point the gloves have come off and Qualcomm is not holding back on their increasingly distant customer. Qualcomm’s countersuit isn’t asking for any specific compensation at this time, but the company is looking to be awarded both compensatory and punitive damages from Apple. And with two of the biggest technology companies in the US now locked into mutual legal combat, it’s likely that this series of lawsuits will go the distance.